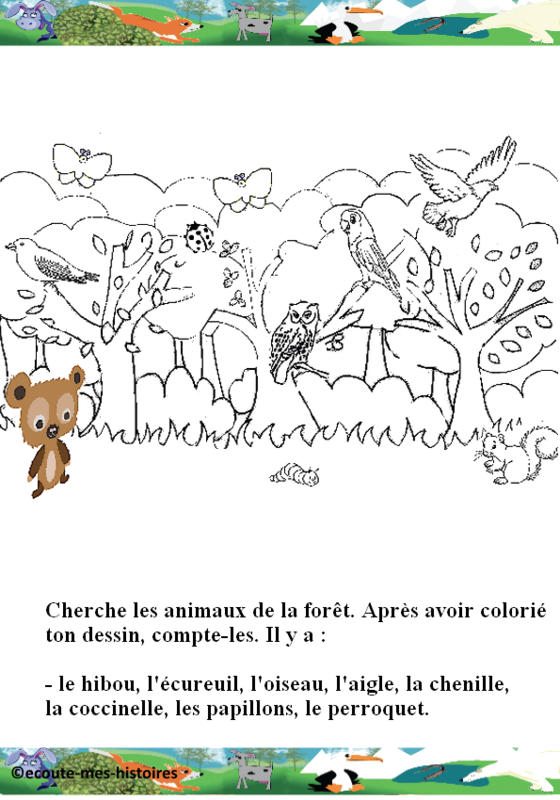 Chapter 3 – Backou under his tree. The tree near Backou’s camp reacts as well . -What is going on? Why those three taps? -I didn’t want to surprise you, tree, but I heard a strange noise and I tapped my paws three times to show that I am strong and that I can defend myself. -Who do you want to defend yourself from? Asks the tree. -I do not know but a strange sound woke me up and I was a little afraid. So by tapping my paws three times, I made noise to scare who ever was scaring me and to give myself courage, explains the bear. -So did you see anything strange? Asks the tree. -No, I cannot see anything. It is still pitch black. -Ask the great sage of the forest, the owl. He can see everything in the dark. Owl, owl, can you hear me? Calls the tree with all his might. Children’s song: Whoo whoo the owl, sang by Versini. The owl, the squirrel, the bird, the eagle, the caterpillar, the ladybird, the butterflies and the parrot. Relaxation: Let’s watch the flight of the owls and listen to the music.